Owner Financing is a Multi-Billion Dollar Untapped Market and it occurs in about 10% of all home sales in the U.S., and it’s growing in popularity every day. Our company has been in business since 1997 and is one of the largest buyers of Owner Financed Real Estate Notes in the country. We have created a program whereby we work together (You and Charter Financial) so that we both make money in this great market. Before we go further, it’s important that you understand exactly how owner financing works, please watch the short animated video below for an easy to understand explanation of our business. Hopefully you now have a good understanding of how owner financing works. It’s pretty simple really, instead of a home buyer going to a bank for a loan or paying cash for a home, the home seller acts just like the bank and finances the home for the buyer. There are many reasons why a home seller would finance the buyer, one is that it makes it easier for them to sell their home when the buyer doesn’t have to qualify for a traditional bank loan and two, sometimes the home seller would like the monthly income that comes from holding the note. Either way, there always comes a time when the note holder decides they would prefer to have a lump sum of cash now instead of waiting years to collect all of their money, this is where you come in. We are going to teach you how to find notes and then you will bring them to us to purchase, we will cash out the note holder and pay you a great referral fee each time. We make money on each deal because we buy the note at what is known as a discount; this means that we do not pay the full value of the note, this is common practice in our industry. For example, if someone has a note with a balance of $90,000 left on it, we might pay $80,000 for the note, we make our money over time as the note pays off. You make your money upfront each time we close a deal for you, the home seller gets their lump sum of money and nothing changes for the home buyer except they now pay us each month. Everyone wins! Our opportunity is really unique because YOU determine your fee on each and every transaction. For example, let’s say that you bring us a note and we tell you that we will pay $100,000 for it. You are then free to determine your own fee on that deal by subtracting the amount you want to make from the amount we offered. Let’s say you decide on this particular deal that you want to make a fee of 5% (the average is 3% – 6% but you are free to charge more or less on each deal). So in this case you would deduct your fee of $5,000 (5% of $100,000 = $5,000) from the $100,000 that we offered and you would then offer the client $95,000 ($100,000 – $5,000 = $95,000). When the deal closes we will pay your client $95,000 for their note and pay you your fee of $5,000 for a total payout on our end of $100,000. You get to determine how much you want to make each and every time. You might be asking yourself, could I have taken a fee of $20,000 on the above example. The answer is yes but then your offer to the client would have only been $80,000 and they might not have accepted. You will find that our offers are market driven and very competitive, and if you take a reasonable fee on each transaction then you will be able to close more transactions. If you are not sure how much to charge, just ask us and we will be happy to provide you with guidance each and every time. There are literally millions of people in this country who are currently receiving payments from an owner financed mortgage note. Our company is a major buyer of these notes and it is our company mission to purchase as many of these notes as possible. We are well funded and have the ability to purchase an unlimited amount of notes. As each day passes, there are literally millions of dollars of new notes being created and this offers you and our company a great opportunity. Since the inception of our company, we have relied on a network of referral agents from around the country who work as independent agents and who bring us these types of deals. We have found that this formula works best for both our agents and our company and the great thing about this is that there is very little competition in the note business. 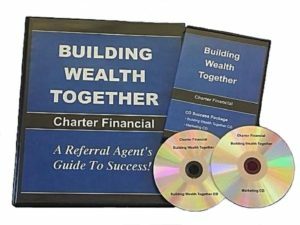 We offer an excellent home study program that will teach you our business, we call it “Building Wealth Together”, because we work together, You and Charter Financial to find as many notes as possible to purchase and we both make money each time. Our program will teach you the most up to date and proven methods of locating notes. One of the best things about working this business is that you really do not have to sell people anything; you will find that note holders will be coming to you for your help in getting them the money they are looking for. Once you sign up with us you will receive everything you need for success, there is nothing else to purchase and no one will call you trying to upsell you on anything else. We would prefer you spend your money on marketing your business and enjoying your new found freedom. There are four easy steps you take to make money working our program. It is really that easy when you work with Charter Financial because we have streamlined our program so that your main job is to Find Note Holders for us and get them to accept your offers, after that we take over and do all necessary paperwork and due diligence in order to close the transaction. Here is a breakdown of each step. Your entire focus will be to FIND NOTES for us purchase so therefore we provide you with all of the marketing methods that you may use to find notes and you simply choose which method(s) fit your schedule and your budget and then use those method(s) to locate as many notes as possible. For example, finding notes on the internet is one method that we teach and a great place to start. You can either place free ads on as many websites as possible, research courthouses for notes (we teach this method as well), place pay per click ads on Google (we teach this method too), or do some “Reverse Marketing”. Reverse Marketing is where you find homes that were recently for sale and being sold with owner financing (homes from 6 months to 2+ years ago) and using our methods, you contact the sellers and see if they would now like to now sell their note. This method is free and easy to locate notes, watch the video below for more information on this great zero cost marketing method. The great thing about this business is that when you do your marketing people will actually respond and ask You to help Them get the money they need (no real selling is involved). When people respond to your marketing efforts all you do is ask them the questions on the Quote Sheet that comes in your package. These are really simple straight forward questions that the note holder will have the answers to. After obtaining the information you may either email it to us, submit the information through our online submission forms or you may fax the information to us. As soon as we receive the information from you we will work up an offer for you, usually within 24 hours. As in all cases, we will make an offer to you and then you are free to subtract your fee from our offer and then make the new offer to the client. Let’s again use the following example. The average fee that our agents charge ranges from 3% – 6%, on the above example the fee was 5%. Our agents have the freedom to decide how much they want to make on each and every transaction, even up to 10% – 20%+ in some cases. We know of no other business where this is the case and is another great reason to work this business. After calculating your fee you then make an offer to the client and when they accept you proceed to step 3. Something of importance to note here is that when you send us the quote sheet we do not ask for nor want to know who the note holder is; we are only provided that information after your offer is accepted. When your offer is accepted then you provide us with the note holders name, telephone number, accepted offer amount and best time to call them. We will then contact your client and introduce ourselves and will email or fax them a purchase agreement and request certain documents from them. At this point you can either stay involved in the transaction by helping us obtain all of those documents, ordering the appraisals, doing title work, setting up the closings, etc. or you may simply hand the deal over to us and our professional processing staff will do the rest of the work for you, either way your fee stays the same. You might wonder how you are protected on each deal and the answer is simple. First of all, our agents are our lifeblood and we would never circumvent them, secondly we have all agents sign our Referral Agreement that states that we will pay you the difference between what we offer and what you offer the client on each transaction. As stated above, we will never know who your client is until your offer is accepted. It takes us on average around 2-3 weeks to complete all of our due diligence on each file and then we fund the transaction. Since we are a national company we always arrange for the note seller to close at a title company or attorney’s office of their choosing, one that is in their area. When our due diligence has been completed and we are ready to fund, we will send the closing agent the required paperwork and we will wire the funds to them. The note seller will go to the closing, sign the paperwork and receive their funds. We will pay you the same day either via a bank wire transfer or company check. It’s that simple and easy! All you have to do is follow those four steps and you are on your way to making great money and having financial independence. Our training package is all inclusive and contains everything you need in order to be a success in this business. You do not need any prior experience because our training is very easy to follow and you receive a tremendous amount of support along the way. Here is what you will receive. This great home study manual will teach you everything you need to know about the note business from learning how to set up your business to completing the transaction. You will be taught all of the latest techniques that you may use to find an unlimited amount of notes. This training manual is the Number One Note Guide on the market today. Upon placing your order you will be given 30 Free Days of Instant Access to our member only website where you will find an enormous amount of training materials. This includes a pdf version of our “Building Wealth Together” manual, recorded training seminars and webinars, forms and documents, sample ads, solicitation letters and everything else you will need in order to successfully run your note business, plus new training materials are constantly being added. After 30 days you may continue your online access for only $14.95 per month. All of our new agents receive two free months of telephone and email support. You will find this service to be invaluable as you begin working your note business. If after two months you would still like to continue with the support then the cost is just $14.95 per month and includes the online access as well. Once you complete your first transaction with us then you receive lifetime support and online access for free. We are regularly hosting webinars and tele-seminars that feature company personal and industry experts. These training sessions will teach you more advanced methods of locating notes and promoting your business. As an active member with us, you are always free to join in. Once your offer is accepted, our staff of processors will take over your deal and do all of the paperwork for you on each and every one of your transactions. This means that all you have to do is focus on finding us notes and we will do everything else for you. This is the number one benefit that all of our agents rave about. You will be updated on the progress of each of your transactions on a regular basis. All of our agents receive bonuses on their first three transactions. These bonuses are intended to reward you and to help you grow your business. On your first transaction we will add an additional $195 to your fee. On your second completed transaction you receive $250 and on your third transaction you receive a bonus of $500. These bonuses are in addition to your negotiated referral fee. Our package includes additional training materials that will help take your business to the next level; this includes information on how to work simultaneous closings, techniques for courthouse research and information on how to purchase a portion of a note. You also learn marketing methods that will teach you how to make several referral fees from the same note. You receive a Two CD set that contains the entire training manual, quote forms, marketing documents, solicitation letters and everything else you will use in your note business. We now also purchase Structured Court Settlements, Annuities, Lottery Winnings and Seller Financed Business Notes. You will receive excellent training on how to work these types of note deals. This information will provide you with more ways to make money with notes because you will open up your business to millions of more note holders who will be looking for a lump sum of cash. We offer you a 30 day money back guarantee. This means that you have 30 days to look over the program and decide if it is right for you. If it’s not, then just send it back and we will issue you a refund, no questions asked. The amount of information we offer and the amount of support we provide is easily worth thousands of dollars. However, we are not in the business of selling information, we are in the business of purchasing notes. Programs like ours are priced from $2,000 – $5,000+ and do not offer half of what we offer. We charge an amount that covers the expenses of locating agents and providing them with support, plus we refund you the cost of the program upon the completion of your first transaction with us. Our complete “Building Wealth Together” training package is now available for Only $195.00. Get Started Today!